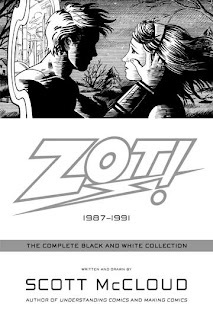 Long before manga took the American comics market by storm, Scott McCloud (Understanding Comics, Making Comics) combined the best ideas from manga, alternative comics, and superheroes into Zot!—a frenetic and innovative exploration of comics' potential that helped set the stage for McCloud's later groundbreaking theoretical work. Zachary T. Paleozogt lives in "the far-flung future of 1965," a utopian Earth of world peace, robot butlers, and flying cars. Jenny Weaver lives in an imperfect world of disappointment and broken promises—the Earth we live in. Stepping across the portals to each other's worlds, Zot and Jenny's lives will never be the same again. I never read this comic when it first came out so when I saw this collection on the library shelf I thought I'd give it a go. Not bad. McCloud's art is very good. I think one of the reasons I passed it over back in the 80's is because the style didn't appeal to me. I was locked into a Jack Kirby/John Byrne/Dave Cockrum/Jim Starlin mindset when it came to superhero art. Well, I liked this well enough that I think I'll try more of McCloud's work. I've always been curious about his Understanding Comics line. Perhaps I'll read that next.